Temporary ID tags and licenses can help identify a lost dog, but microchips are designed to provide an under-the-skin form of identification that lasts for decades. Get the facts you need about the microchipping and registration process. A microchip is a radio-frequency identification (RFID) device that is implanted beneath the skin. The actual chip is about the size of a single grain of rice, and it stores a great deal of information, including the name and contact information of the chip manufacturer, as well as a series of unique numbers that identify that pet. The chip is designed to communicate with a hand-held scanner, which can display the information contained inside the chip. Microchips are designed to fit through a large-bore needle, making implanting quick and easy. Large-breed dogs might not even feel that needle slide into their skin, and they might be able to stay awake as the shot takes place. Smaller dogs, on the other hand, may find a big needle much more intimidating and painful, and they might need anesthesia in order to get through the procedure. Microchips are inserted between the shoulder blades of a dog, and typically, they're impossible for people to feel with their fingers. As a result, there's no way to tell whether or not a dog has a microchip without using a scanner. A visual inspection or a touch test probably will not provide any clues at all. When a dog appears in a shelter or veterinary office, and no owners are nearby to take responsibility, it's common for the staff to pick up a scanner and look for a chip. They might wave that scanner all over the dog's body, as chips sometimes move from their injection sites to other spots on the animal's body. When the chip is spotted, the staff can call the chip manufacturer, and ask for information. Ideally, that number will correspond with a detailed file that contains the name and contact information for the clinic that placed the chip, as well as the name and contact information of the owner. Many people mistakenly believe that chips will magically reunite them with their pets if they take no other steps at all, but most chips contain only the name of the vet or shelter who placed the chip. Unless owners register that chip, the pet might never make it home. Most microchip manufacturers provide detailed instructions outlining how owners should register the chips their pets have. 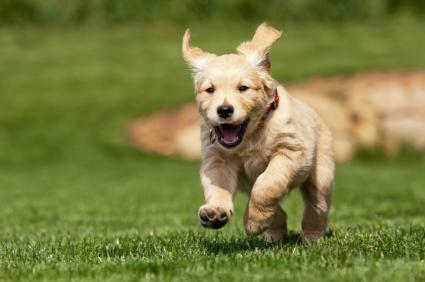 Once owners register their dogs, they should store the microchip documentation in a safe place. If they move, change phone numbers or otherwise have a different set of contact details, they'll need to contact the chip company and update their contact details. There are a number of manufacturers who develop and sell microchips for pets, but two that are considered the most reliable include HomeAgain and Avid. The HomeAgain company claims that it provides a product that will stay in place for easy locating. Many microchips can migrate from the original placement site, making them harder to find, but the wrapping on the HomeAgain product might make that chip more apt to stay where it belongs. Registering the HomeAgain chip is quick and easy although there may be fees involved in changing addresses and contact information. This company has been producing microchips for pets for well over 20 years, and the company uses a unique 9-digit number that can quickly and easily be recognized by most medical professionals. Avid also keeps staff on hand around the clock, so they can answer questions at any time and reunite lost pets with their owners as quickly as possible. Enrolling in this system is free. Feed stores and online retailers often sell DIY microchip solutions for owners who aren't squeamish about using a needle on their dogs. While these products can be much less expensive than a standard chip sold in a clinic, they may not be the best choice for people who really want to keep their pets safe. These companies may have very small offices with staff members available only during specific times of day consequently making it difficult for a busy emergency veterinary clinic to reunite a lost pet with its owner. In general, it might be best to stick with the big brands, and pay a little more to have a professional do the implanting. Veterinarians are often the front-line purchasers of microchips, and many offices provide only one chip to their customers. As a result, it's not uncommon for dog owners to have few choices when it comes to chips, unless they choose to visit another location for care. Sometimes, it might be a good idea to do a little shopping. Dogs that escape tend to stick close to home, arriving in animal shelters or veterinary offices within just miles of the places they left. Scoping out these facilities should be the first stop on the discovery process. Many animal facilities have so-called "universal scanners" that can provide information about almost any type of chip that an animal might have. These scanners might even be able to read microchips that are older, or those that were made overseas. But sometimes, facilities might have a specific scanner that reads only one chip. If the nearby shelters and clinics have scanners that can read only one type of chip, then that's the type an owner should get. This is the chip that is most likely to help people reunite with their pets, so it's the best choice. Veterinarians may have very good reasons for choosing the chips they offer, and that choice might be based on information an owner hadn't considered, including the size of the pet or the quality of the product or the number of complications associated with that chip. It's best to let the veterinarian explain those reasons, if the scanner used in nearby shelters and clinics isn't compatible. The veterinarian may even encourage the chip manufacturer to send a scanner to these organizations so the product will be yet more valuable. Choosing the right product is key, but there are other important details to keep in mind. These fees can add up, so comparison shopping may pay off in the long run. In general, microchips are considered safe, but there is always a risk that the unexpected might happen and the procedure won't go as planned. It's best to monitor the injection site closely and look for signs of trouble. Ask the staff to scan the chip each year during a checkup, just to make sure the device is still working. Nothing takes the place of a vigilant owner who keeps close tabs on a beloved pet. However, sometimes a pet can run away or escape. When it does, a microchip can be very useful. A 2009 study published in the Journal of the American Veterinary Medical Association found that dogs with microchips are 20 times more likely to be returned to their homes. This makes microchipping well worthwhile, no matter what brand of chip a person might choose.